José Francisco de San Martín (25 February 1778 – 17 August 1850) was an Argentine general and the prime leader of the successful struggle for independence from Spain of the southern nations of South America. Together with Simón Bolívar in the north, San Martín is regarded as one of the Liberators of Spanish South America. He is a national hero of Argentina. San Martín was born in the town of Yapeyú in the province of Corrientes, Argentina, then a Spanish colony (part of the Viceroyalty of the Río de la Plata). His father was a Spanish official. He was educated at the military academy in Madrid, commissioned as a Second Lieutenant in 1793, and rose to the rank of Lieutenant Colonel in 1808. He fought with the Spanish army against Portugal, in the African colonies, and against the invasion by Napoleon I's forces. In 1812 he resigned from the Spanish army and sailed home to Argentina, where he offered his services to the revolutionary forces. San Martín occupied Lima, the capital of Peru, on 9 July 1821. This was a huge loss for the Spanish forces. On 28 July he was voted the "Protector" of the newly independent nation. During the same year, he founded the National Library of Peru, to which he donated his collection of books, and praised the new library as "... one of the most efficient means to spread our intellectual values". 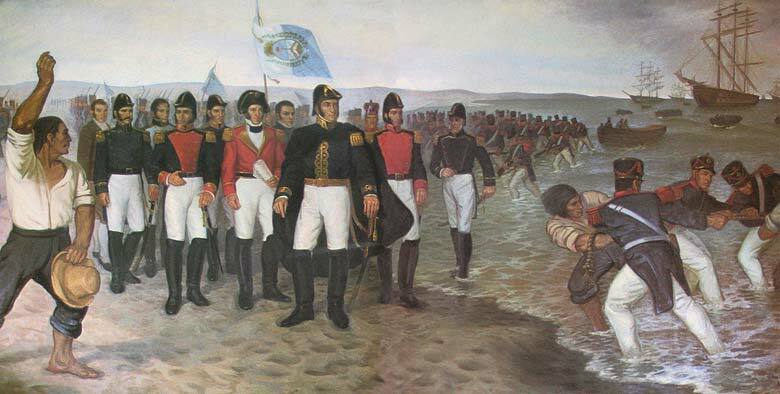 San Martín finally declared independence from Spain for Peru on 9 December 1824. After Peru's parliament had been assembled, he resigned his command. In 1824, after the death of his wife, Remedios de Escalada, he moved to France with his daughter, where he spent the remainder of his days retired at Boulogne-sur-Mer. His last act on Argentine soil was accepting a gift from Buenos Aires governor Juan Manuel de Rosas and refusing to fight in the civil wars that tore the country apart. He was almost blind and had many health problems because of his advanced age, but continued to write letters and keep in touch with the news from South America. Shortly after receiving the news of the Argentine victory against the Anglo-French blockade, he died, three o'clock on 17 August 1850. José de San Martín died on 17 August 1850, in his house at Boulogne-sur-Mer, France. Between 1850 and 1861, his corpse was buried in the crypt of the Basilica of Notre-Dame de Boulogne. He requested in his will to be taken to the cemetery without any funeral, and to be moved to Buenos Aires thereafter. Balcarce informed Rosas and the foreign minister Felipe Arana of San Martín's death. Balcarce oversaw the embalming of his remains and their temporary stay in a chapel of the city. He also sent San Martin's saber to Rosas. 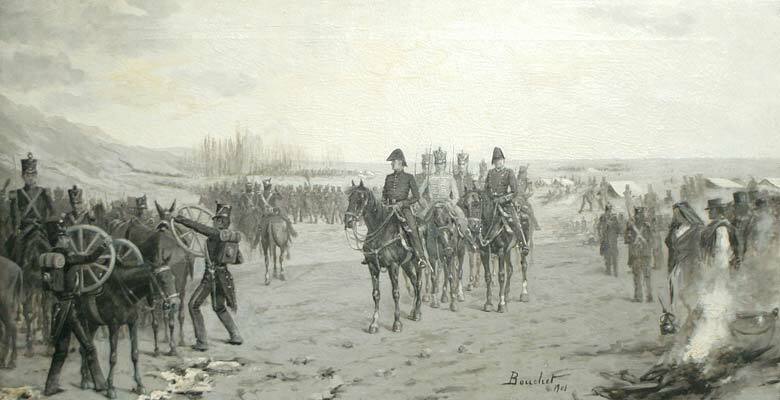 San Martín's remains were removed on 29 May 1880, during the presidency of Nicolás Avellaneda. 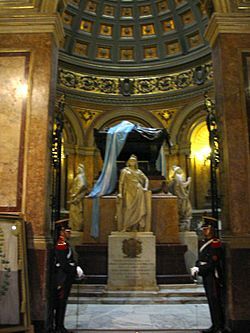 The mausoleum was placed inside the Buenos Aires Metropolitan Cathedral. As San Martín was suspected of being a freemason, the mausoleum was placed in an expanded wing of the Cathedral. 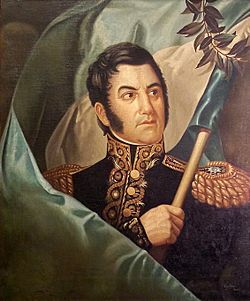 San Martín was first acclaimed as a national hero of Argentina by the Federals, both during his life and immediately after his death. Statues of San Martín appear in most cities of Argentina, as well as in Santiago and Lima. There is also a bust of San Martin at the Intramuros or Walled City of Manila, which was erected in 1950 at the request of the Perón government as a reminder that San Martin's brother, Juan Fermin, served in the Philippines from 1801 to 1822. José Gil de Castro made the first portrait of San Martín, and several other artists made works about him. The most important films featuring San Martín are the 1970 El Santo de la Espada and the 2010 Revolución: El cruce de los Andes. 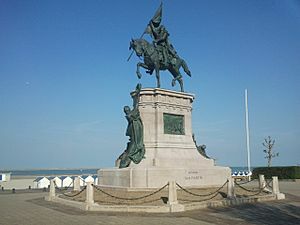 An equestrian statue of the General was erected in Boulogne-sur-Mer; the statue was inaugurated on 24 October 1909, at a ceremony attended by several units from the Argentine military. Located on the beach, it was virtually untouched by the numerous bombings campaigns during both world wars. There is also an equestrian statue of General San Martín in New York City, on the southern side of Central Park. It was dedicated in 1951 and was donated by the City of Buenos Aires, Argentina. Also there is an equestrian statue in Washington D.C. along NW Virginia Street. It is a copy of a statue in Buenos Aires. It was given in 1925 from Argentina. General Liberator San Martin Drive roadway in the Ku-ring-gai National Park north of Sydney Australia is named in his honour. The neighbourhood of San Martín in Bogotá, Colombia's Centro Internacional area is named for the large equestrian statue of the General situated in a small plaza also named for him. New Delhi, India also has a San Martin road. Mausoleum of San Martín at the Buenos Aires Metropolitan Cathedral. 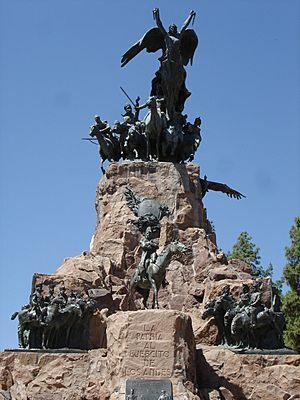 The three statues are national personifications of Argentina, Chile and Peru. José de San Martín Facts for Kids. Kiddle Encyclopedia.